With these homemade fondant recipes, you can make a wide variety of quality molded candies and delectable hand-dipped chocolates. The old fashioned recipes present some great ideas for making homemade candies that are perfect for both eating and gift giving. Make some today. Fondant, the basis of all French candy, is made of sugar and water boiled together (with a small quantity of cream of tartar to prevent sugar from granulating) to soft ball, 238°F. The professional confectioner is able to decide when syrup has boiled to the right temperature by sound while boiling, and by testing in cold water. These candy boiling tests at first seem somewhat difficult to the amateur, but only a little experience is necessary to make fondant successfully. A sugar thermometer is often employed and proves valuable, as by its use one need not exercise his or her judgement. Simply go by the temperature. 2-1/2 lbs sugar, 1/2 cup hot water, 1/4 teaspoon cream of tartar. Put ingredients into a smooth-granite stewpan. Stir, place on range, and heat gradually to boiling-point. Boil without stirring until, when tried in cold water, a soft ball may be formed that will just keep in shape, which is 238°F. After a few minutes' boiling, sugar will adhere to sides of kettle; this should be carefully washed off with the hand first dipped in cold water. Have a pan of cold water near at hand, dip hand in cold water, then quickly wash off a small part of the sugar with tips of fingers, and repeat until all sugar adhering to side of saucepan is removed. If this is quickly done, there is no danger of burning the fingers. Warning! Using a wet pastry brush or small damp cloth instead of the hand is much safer for those inexperienced in candy making! Pour slowly on a slightly oiled marble slab. Let stand a few minutes to cool, but not long enough to become hard around the edge. Scrape fondant with chopping knife to one end of marble, and work with a wooden spatula until white and creamy. It will quickly change from this consistency and begin to lump, when it should be kneaded with the hands until perfectly smooth. Put into a bowl, cover with oiled paper to exclude air, that a crust may not form on top, and let stand twenty-four hours. A large oiled platter and wooden spoon may be used in place of marble slab and spatula. Always make fondant on a clear day, as a damp, heavy atmosphere has an unfavorable effect on the boiling of sugar. 2-1/2 lb sugar, 1/4 cup ground coffee, 1-1/2 cups cold water, 1/4 teaspoon cream of tartar. Put water and coffee in saucepan, and heat to boiling-point. Strain through double cheese cloth; then add sugar and cream of tartar. Boil, and work same as White Fondant. 1-1/4 lb maple sugar, 1 cup hot water, 1-1/4 lb sugar, 1/4 teaspoon cream of tartar. Break maple sugar in pieces and add to remaining ingredients. Boil, and work same as White Fondant. Two cups white sugar, 1 cup water, 1/8 teaspoon cream of tartar. Mix all ingredients together and place over heat, stirring until all the sugar is dissolved. Be very careful not to let any of the mixture get up on the sides of the saucepan, as they will form crystals, which, if dropped into the syrup, will spoil the texture of the fondant. Cook slowly until the syrup will form a soft ball in water. Have a large platter, well buttered, ready and pour the fondant on it very slowly. Never pour fondant faster than it can spread itself. Let it stand without disturbing until partly cool and a slight wrinkle forms around the edge. Then begin working with a spatula, lifting the fondant each time from the edge and turning toward center. Continue working until it is white when the hands may be used to knead it. To a portion of the fondant add a few drops of oil of cinnamon and a few drops of pink coloring. Knead until thoroughly blended. Form into small logs and roll in chopped nuts. To a portion of the fondant add vanilla flavoring; knead well. Shape into small balls and place a half of a walnut on the top of each. Drain well some canned cherries. Make small balls of fondant, placing in the center of each a cherry. Roll in shredded coconut. Melt dipping chocolate (or plain chocolate bars are much cheaper), and dip the balls of fondant. Lift out with a fork onto waxed paper, making a tiny twirl on the top of each candy. Take a portion of the chocolate and knead until well blended. Press out into a rectangular shape, quite thin. To an equal amount of fondant, add a few drops of oil of peppermint and knead. Press out into same shape as chocolate, then place on top of it. Roll up like a jelly roll and chill for several hours. Cut into thin slices. Remove stones carefully and stuff with fondant. Fondant makes excellent centers for chocolates. 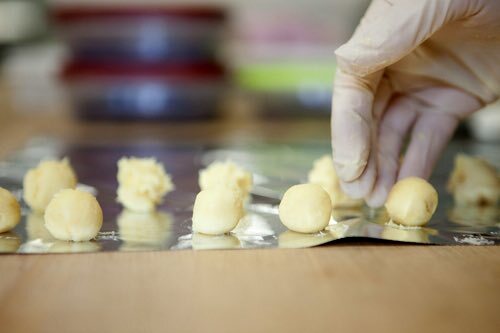 You can easily mold creamy fondant into uniform balls or egg shapes by using your hands and rolling them between the palms to make them smooth. Any of the fondant recipes may be used for chocolate making. Also, you can use a fondant or candy mold to shape the softened fondant into fancy shapes. Candy molds now come in hundreds of shapes and sizes and are readily available from online stores. Simply press the soft fondant into the mold. If you spray the mold lightly with cooking oil first, the fondant will release more easily. Once your fondants are molded, chill them for a while in the refrigerator in preparation for dipping in chocolate. Have fun with the homemade fondant recipes above. Several methods are given to experiment with. Making your own fancy confections could be the beginning of a rewarding hobby.